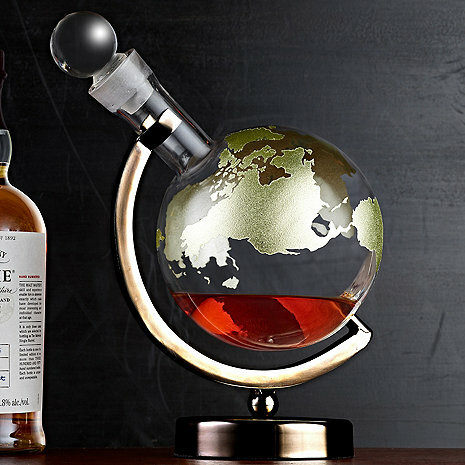 Striking hand-blown glass whiskey decanter with gold inlayed map makes an impressive statement piece for your home bar or study. The decanter, positioned on a gun metal stand, spins smoothly on its axis, allowing you to admire the richness and color of your favorite whiskey, bourbon, scotch or port. The spin also promotes aeration, allowing flavors and aromas to mature and develop. Fitted glass stopper creates a secure seal for ideal storage, keeping your favorite spirit flavorful and aromatic. Hand wash only. Are the glasses included with this globe?